I finally broke down and decided to review YNAB, better known to some as You Need A Budget, the premier personal budget software package. And even though I’m a professional financial advisor and Certified Financial Planner, what you do financially dwarfs the importance of my work. That’s right. Even if you had Warren Buffet working for you, it would be useless if you didn’t know where and how you spent your money. I say that because of my experience. I don’t care how much you make. The balance you strike between income and spending is the most important predictor of your financial future there is. Let me say that again a little differently. The best predictor of your financial security is how much you know about and control your budget. If you’re a regular reader, you know that I’ve suggested a few different approaches to mastering your budget. One of my favorites is using your bank statement to tell you how much you spend on average each month. I constantly receive unsolicited endorsements of the program from clients, readers and friends. As a result, I figured it was worthwhile to look into. Once I took a look “under the hood,” I realized how powerful an agent it could be to help people really get their financial houses in order. I kicked myself for missing out on the benefits, but I wasn’t about to let any more time go by. The idea is that you use the money you earned last month to support yourself this month. You don’t spend money you earned this month – or the money you think you’ll earn in the future. This is a stroke of genius, and frankly I’m disappointed I didn’t come up with it myself. This system helps get you out of the habit of living on money you don’t have. In order to achieve this, the software actually helps you stash a month’s earnings away. If you are in debt, accomplishing this may seem daunting. However, saving a month’s earnings isn’t as difficult as you might imagine. The folks at YNAB give you some great ideas on how to get this done and even build up to it. And thousands of others have used YNAB to stop living paycheck to paycheck. Why shouldn’t you be able to do it? This is something I’ve never done but I can see how important it is. You basically assign every single dollar you earn a role. (It takes about 20 minutes the first time. After the first month, you can handle this task in about 20 seconds.) A particular dollar’s job can be to pay for current needs or it can be to provide for future needs or saving…but every dollar has a specific task. You might be pretty good at handling your day-to-day expenses, but how do you handle those unusual bills? Do you panic when the insurance bill comes due? Property taxes? When it’s time to fix the roof? The software is designed to get rid of this roller coaster ride by smoothing out your true expenses. Me likey. They actually build that into the system. It’s OK to blow it but it’s not OK to give up. If you’ve ever started a budget “diet” only to fall off the wagon, you know how important a lifeline is. This software is designed to help you when you hit those life bumps. It took me about a minute to install YNAB and it was a good omen. I like that the designers have made it easy from the start. You won’t have any troubles here. When I clicked on the icon, the program opened immediately and it showed me the pretty picture above. 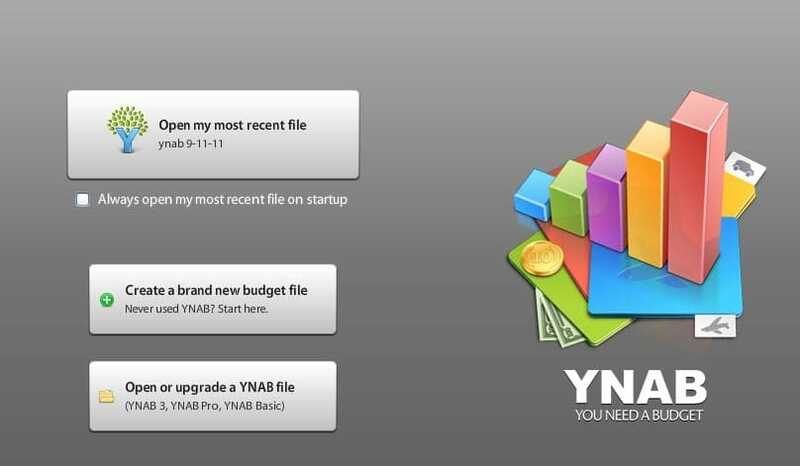 As you can see, you are invited to open up your most recent file, create a new budget or open or upgrade an existing YNAB file. I created a new budget. If you are a new user, the program asks if you are going to use the software for personal or small business use. This is a new feature and super handy. The program will pre-populate categories that are commonly used depending on how you answer that question. Of course you can customize these categories, but this feature sets YNAB far apart from Quicken. Then you select the currency you use and the date format you prefer. This makes the program really useful worldwide. The list of currencies is pretty extensive too. So if you plan on moving anywhere in the world from Estonia to Rufiyaa, these guys have you covered. Thank you, YNAB! At this point, my choices are “Budget,” “Add Account” or “Reports.” Obviously, I couldn’t run a budget or report until I have my accounts set up and input some data. Even if this wasn’t clear to me, the “Getting Started” tutorials (documentation and video) would walk me through the setup stage really well. Also, you can see the very large brown “Click the Add Account Button” above. Kind of makes it easy to do it right. When you select “Add Account,” you create an electronic checkbook register. This is where you’re going to record your expenses and deposits in each of your accounts. You can open a new “account” instantly and easily. The program walks through the steps and asks you all the right questions, and it takes less than a minute to get set up. 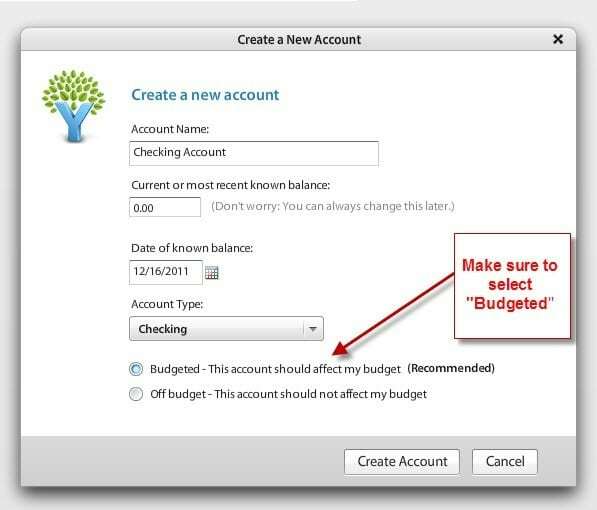 Make sure that you select “Budgeted.” If not, you won’t be able to compare your actual numbers to your budget plan. That would defeat the entire purpose. The electronic register shows you what your balance is at all times. And you can always access the tutorials regardless of where you are. Nice. Adding entries to the register is a breeze. 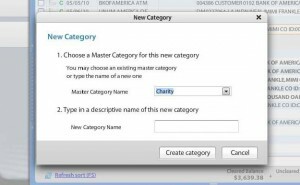 Just click where it says “add a new transaction.” Type in the date, payee and category. Once you enter a payee, YNAB remembers. That saves you time since you won’t have to type those payees’ names in month after month. Then you can make any memo if you want. Last, indicate the amount as an inflow (deposit) or outflow (expense). Doesn’t hurt a bit. Some people use the “recurring transactions” feature, but I don’t. What this does is allow you to tell YNAB that a fixed amount is going to be taken out or added to your account each month for a certain payee. I don’t use this feature because I just add every transaction as it clears the bank and I download the data from my bank. Let’s move on. The power of this program is really in how you use the categories. You see this “assigning categories” issue is often overlooked, but that’s a mistake. When you assign a category to an expense, that’s how you track your spending. And if you don’t assign the right category…you’re not tracking your money. If the program you use makes assigning categories difficult, you’ll backslide. You’ll take the easy way out. If that’s the case, you shouldn’t bother using any software at all. I like the way YNAB handles categories. You Need A Budget has quite a few categories set up already but if you need to create a new one, it’s much easier to do than with Quicken or Quickbooks as I said above. You can also split an expense across many categories, which is handy. That’s important because when you go to Costco, you might spend $200… but $100 on groceries and $100 on clothing. The split function allows you to keep track of that. When downloading transactions, you can either manually input your transactions as I just described or download them from your bank and credit card company. Most banks allow you to download data and I’m a huge fan of doing so. It saves me a ton of time. YNAB allows you to import data from just about any format, so if your bank provides any downloads, YNAB will work for you. YNAB tells you that they recommend .OFX and .QFX formats and they support .QIF. These are the formats most banks and credit card companies use so you should be fine. The program also works with .CSV files, but that is only recommended for advanced users. One complaint that others have is that you have to download and save the file from the bank before importing into YNAB. I can tell you that it’s no big deal. I’ve been using Quicken and Quickbooks for years, and even though the download is seamless it still takes a long time to get all my transactions into those old dinosaurs. That’s because of the arduous way Quickbooks and Quicken handle categories. All told, it was actually easier to get the data into YNAB even though the download isn’t seamless. In short, the data importing feature was really a pleasure to work with. All the transactions downloaded fast and assigning categories to each transaction was fantastic. Let’s get back to “search.” I love this function. How would you use it? Let’s say the doctor says you didn’t pay her and you know you did. This search feature will help you prove it faster. You can also see how many times you visited Starbucks and how much you spent there. The search box will show you every time you spent money with any vendor. You can also export this info to Excel. If not, what do you need to do differently? This is a huge benefit to you that no other program offers. As you can see, it’s pretty straightforward. Just download your data and input your budget. But here’s the feature that really made me fall in love with YNAB: The program won’t let you budget money you don’t have. This is what makes YNAB different and better than anything else I’ve seen on the market. This feature forces you to live within your means. I love it and so should you. The screen shows your budgeted amount, the actual money spent and any balance. Just what the doctor ordered. We’ll take a closer look at this in a minute. I mentioned categories above when we looked at data input. Now, let’s see how to use them with your budget. 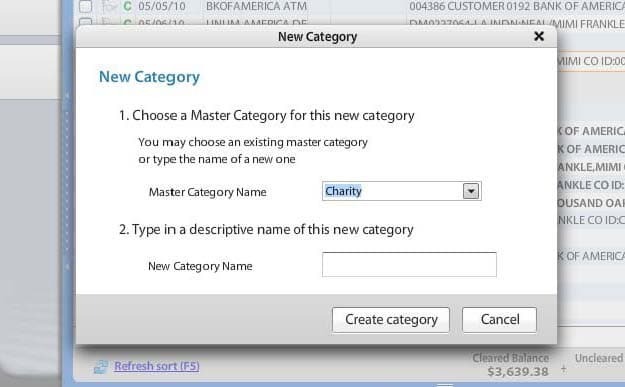 The program comes with default “Master Categories,” but you can change the names and add new categories. These are your major buckets of expenses. I have such master categories as Charity, Investing, Utilities, Groceries, Auto, Clothing, Recreation, etc. Under each master category you can create sub categories. Once you set up your categories you are ready to set up a budget number for each category. When you input or download your actual numbers, you assign each transaction to one of these categories so you can see how you’re doing. The budgeting window is built around your “Available to Budget” amount, which is taken from your account balance automatically. If you don’t have the money…they won’t let you budget it. Built-in accountability without the whining. YES! Let’s look at an example. You can see that I have budgeted $11 a month for tithing. In December of 2011 that’s what I spent, so my balance is 0. If you look at January 2012, you’ll see another budgeted amount of $11 for tithing. That’s how much I can spend in that category in January. I don’t eat much, so I budgeted only $60 for groceries in December and I forgot to budget anything for groceries in January. I actually spent only $10 on groceries in December (I was on a diet) so the balance is $50. That balance gets carried forward to January. If I go back and fix my error (as I should), I’ll have a budget of $60 for groceries in January plus the balance carried forward of $50. That means I can have a party and spend up to $110 for groceries in January and still be within my budget. I also budgeted $50 for electricity in December but spent $60. That means I ran a $10 deficit. Since I also budgeted $50 for electricity in January 2012 and since I have a deficit of $10 that gets carried over, I can actually only spend $40 for electricity in January. You see? The program shows me how to make up for my overspending. In reality, the program will allow you to either spend less on electricity in January or just cut back the “Available to Budget” by $10 and let you decide where to make the cuts. No such thing as “deficit spending” in YNAB land. Should we buy a copy for the boys and girls in Washington? YNAB also allows you to save for future purchases or events. This way, when the insurance bill comes due three months from now, you’ll have the money to pay for it. Nice. All the personal budget software programs have nice reports, and YNAB is no exception. YNAB’s reports are clean and easy to understand. You can also export the data into a .CSV file, which will allow you to play with the numbers in Excel. While you might be a person who values having a wide variety of reports, I’m not. I just want to see my actual expense versus my budgeted expense. The “Budget” screen tells me everything I need to know. Did I spend what I said I’d spend? If not, what’s the problem? End of story. That’s the only report I need, and YNAB delivers it like no other program. If you want other reports or want to export the data to Excel and go wild…YNAB will oblige. You can run spending, net income and net worth reports. What else could you want? The support is another feature that shines. YNAB includes dozens of video tutorials and on screen help (see the FAQs below). Also (and this blew me away), they actually provide online classes with real human instructors available to answer your questions. So if you need someone to hold your hand as you set up the software and/or implement it, this is your dream come true. Just try to call Quicken or Quickbooks for this kind of support and you’ll know how valuable this feature is. Quicken and Quickbooks don’t offer anything like this. You Need A Budget is an excellent piece of software. It’s simple to use and easy to understand. The tutorials are great and the program gets the job done. Unlike other programs I’ve seen, YNAB is “solutions” oriented. If you are in debt, living paycheck to paycheck or not saving money fast enough, YNAB is what you need. If you know what to do but somehow don’t do it, the built in “accountability partner” features should really pay off for you. If you’ve used Quicken or other software and felt overwhelmed by the complexity and underwhelmed by the support and results, you’ll enjoy YNAB and what it can do for you. I also think this is a fantastic gift for college or high school graduates. Let’s get them started off on the right foot…right? You have a system to track your spending that’s working. You’re not in debt, you don’t live paycheck to paycheck and you save money fast enough. If it ain’t broke, don’t fix it. You’re looking for a program to track your investments (YNAB isn’t your best choice). I’m recommending this program to all my clients and I recommend it to you too. It’s easy, simply and quick. It holds you accountable and keeps you on track. It’s the strongest budgeting software available and offers support that is unparalleled. The price is only $60, so grab your copy now. Also, they provide a free 34-day trial and a full 30-day money back guarantee. Try it. What have you got to lose…except maybe some debt? You should get this for your kids or grandkids if you don’t need it. The benefits to them are enormous. There are free programs out there and you also have the option of making a spreadsheet up yourself. But you won’t get anything like the payoff that this program offers. I have an accounting degree and I’ve been working with clients who struggle with their finances for over 25 years. I also have the luxury of alternatives. I can endorse any program I want. I would not bestow the Pilgrim seal of approval unless I was 100% satisfied that YNAB was the way to go and I can tell you that it is. Does the program automatically back up – No, not in the current version, although that feature is on the way. It does prompt you to save though if you haven’t yet when closing the software out. Does it offer print features – Yes. You can print reports, the register and the budget directly to PDF file for e-mailing, archiving or printing to paper from there. How large is the PDF setup guide – The entire manual is 106 pages, but the guide to get started is only a single page long. Everything that you will find in the manual is within the software and is backed up by extensive ‘inline’ help with pop-ups that guide you every step of the way. How many tutorials are there – 44 currently with more on the way. How often are the classes held / How many per week – At a minimum weekly with as many as three or more at times and all of them are completely FREE and without any obligation at all. How long does it take for the average user to become capable – That’s a tough one because it’s truly dependent upon the individual’s ability as well as how much they want to put into learning the ropes. That said, YNAB is different but it’s not difficult, and on average you could learn it in an hour – the length of our getting started webinars. How long is the guarantee / What are the terms – The money back guarantee is for 30 days no questions asked. Can it run on Mac or Windows – Yes! 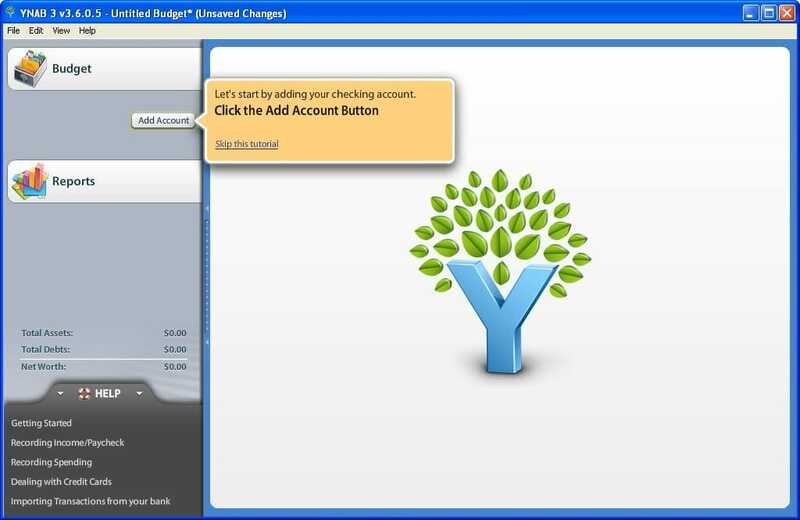 YNAB 3 will run on Windows, Mac or Linux computers and you can easily share the very same budget data file amongst the three without the need for conversion. Great review thank you…one of the best for YNAB, and it’s very convincing. My question: This is a tracking program, not a real-time program, correct? Meaning, that it’s a desktop program that will be located on one computer (the home computer) and will not be accessible by multiple users…(odd phrasing, I know)? What I’m looking for is the kind of budgeting software that you cited in your YNAB review, but also something that can update and show me my spending as I live day to day. Ideally this would be something like Mint that could be accessed by both me and my wife. So that we can both have our eyes on the daily ins & outs of our accounts. Is there any reason to use YNAB vs. MINT, or to use them in conjunction with one another? I would use one or the other – not both. And with YNAB I know you can backup and restore to DropBox but I don’t use it real-time so I can’t really respond. But that is a good question and I’m glad you are taking this seriously. Let me know what you decide on….Thanks! YNAB has a feature where it syncs encrypted files with Dropbox, which are then accessible via an iOS or Android app. Since using YNAB I’ve abandoned my checkbook register altogether. When I’m out and about shopping, I can check my budget on my phone and also enter my spending and/or income, tagging items against my budget categories. The budget balances automatically adjust in the phone and when I get back to my desktop computer, everything is also already matched there. YNAB also doesn’t require that you enter your actual bank login info the way Mint does. I don’t feel comfortable putting bank logins and passwords into a third party system. In YNAB you’re just recording and tagging expenses or income items against your budget categories, including on the fly on your phone. Every so often you also reconcile the budget with your bank statement (or your current bank account balance when you log into online banking). YNAB is super easy, instantly and currently available in your pocket, and it avoids exposing you to potential identity theft or account syphoning the way Mint does. The only thing you need is a Dropbox account (their free account works) and to set YNAB up so that it syncs with it. The files that sync to Dropbox are proprietary and encrypted so that even if somebody hacked into Dropbox (unlikely) they still couldn’t read those files. Glad you dig it Pilgrim! On the advice of a close friend and a couple of reviews, including this one, I’m getting ready to download the trial. Any thoughts on the budgeting guide? Think it’s worth the additional $47 (or $37 if I bundle). My experience is that it’s well worth it. YNAB has been a game changer for me and my family. All my adult children (shortly after college) use it too. What have you got to lose? Response from Jesse at YNAB to question about memorized catagories! You’ll want to look at the Payee Settings (View -> Payee Settings), where you can have YNAB categorize imported transactions based on those transactions’ payees. Just categorizing a transaction one way doesn’t create a ‘rule’ for YNAB. You have to be a bit more explicit about it. You can set a specific payee by right-clicking on its transaction, and going to payee settings there as well. I am struggling to setup Categories so that when I import a QIF downloaded statement the transactions get automatically categorised. I painstaking (over 200 monthly transactions) right clicked every transaction and categorised them but when I imported the next statement they were not categorised. Is there a tutorial on this? I and got some info on this. Not sure if this answers your question but it might. If not, contact support. They have been really good at responding. I have also sent the question to the developer and I hope he’ll respond shortly. I use Quicken and didn’t see in your review a compelling reason to switch. Can I import my Quicken data for the last year into YNAB? Chari, you can import that data into YNAB according to their site….but if Quicken is working for you, I suggest you stick with it. Is it helping you reach your goals? That’s all that matters if you ask me…. I’m curious how YNAB will work for our household where income is inconsistent. I am a consultant whose income varies WIDELY each month and my husband has a consistent base pay, however a high percentage of his income is commission-based so varies a good bit. Is YNAB budgeting software geared toward people with traditional, consistent income? My experience is that this should not be a problem. It is a tracking program. You can assign income to any month you like and even if you have a low income month, that doesn’t really impact your expenses. This will help you track your expenses and that is the main payoff. I have been using quicken on windows and we now have a mac. So I was looking into ynab. one thing i liked about quicken is I can schedule all my bills and income and then it keeps a running total on a monthly calendar. if I want to know how much extra money i should have in my account say 6 months from now, i can click on that month and see. this gives me an idea when i can pay something off, like a loan. does YNAB have a feature where i can click several months ahead and see where i am at. I am on the trial month with YNAB and am loving the clarity it brings to my personal finances. Here’s my question. I am a small business owner (solopreneur). 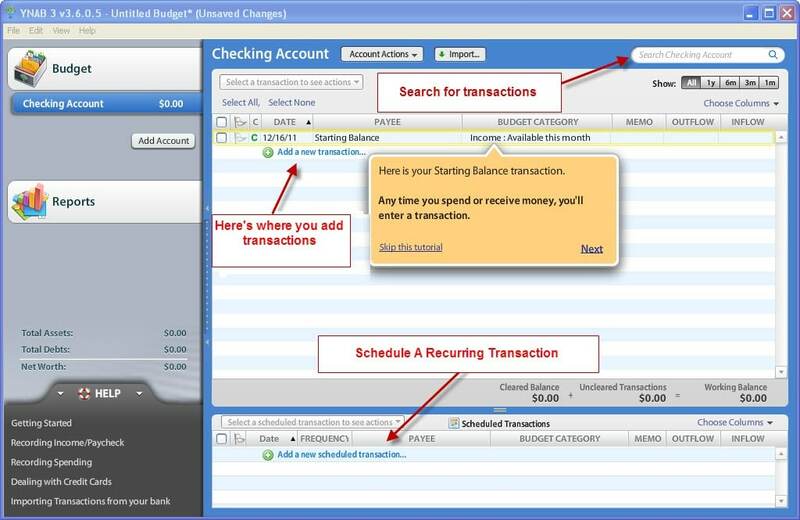 I use Quickbooks to record my business income and expenses. However, I find YNAB so much cleaner and user friendly. What is your opinion on using YNAB as business accounting software and doing away with Quickbooks? Hey Sasha. Glad you are digging YNAB. I asked myself the same thing and . I’m sticking with Quickbooks for my business for the time being. It provides my CPA with easy access to what he needs. I have spoken to YNAB about being more small business focused and I believe they are working on it. I will keep you posted friend. I am currently using the trial version and plan on buying it; I think it’s great. Also, now YNAB offers sync capabilities with Dropbox which allows me to use my iOS (or Android) devices and keep everything up to date. Moreover, this serves as a backup which addresses concern #1. Thank for the review. I love YNAB. My wife and I have been using it since December. The phone apps and pc software work seamless through dropbox. My wife and I know at all times how much money we have left for each category. Toby, glad it’s working for you. As you know I am a huge fan too. Keep it up sir! I enjoyed your review and have been contemplating purchasing YNAB. It seems to be a great software. I have some good friends that use it and they have the same positive remarks as you do. Just one question… If I were to buy it now at the $6o and there are updates to the software in the future that I would want, would I have to purchase it again, or would these available to me? Raelene, They offer free updates for fixes. When they come out with a major upgrade, you have to pay for it but you don’t have to upgrade if you don’t want to. For example, the last upgrade to 4.0 was amazing and well worth it. I bought the software about 3 years prior but was only too happy to pay for the newer version. That worked out to be like $20/year and it saved me so much more than that. Again, you don’t have to upgrade but because they really jam a lot of value into the upgrades when they do release them, you probably will want to. I’m probably dreaming here but I’d like to be able to have this software on my home computer and on my work computer so that my wife and I could use it throughout the day separately but have them “synced”. Otherwise it seems I would have to input data on both computers to keep them “synced”. You can use one license as much as you want. To do what you want, I suggest doing a back up and restore. You could use drop box to do this so it would be easy. The only caveat would be to make sure you coordinate and don’t both update the file at the same time. Make sense? Thanks for the answer but I have since found out that you can use the cloud to keep all of your computers on track at the same time as well as your mobile devices. Right…but you still need to careful about coordinating using the files. Let me know how it goes. Excellent review. Thanks, I can’t wait to try YNAB. Having said that, there are still a few things I’m looking for and now that Windows8 is out, I’ve decided to go back to MS Money (Sunset edition) & I have to say I did breath a sigh of relief when that MS Money start up melody played thru my speakers… no more feeling restricted & constrained when it comes to tracking & managing my money. Don’t get me wrong, I like YNAB & I was close to buying it. It’s far better than others I’ve tried (quicken, SEE Finance etc) but like many out there, it doesn’t beat the good ol’ MS Money. Keep it up YNAB, I’d love to switch – considering MS Money is already years out of support & development – when the product suits my needs. I have been using YNAB for a few days and love it. I wanted to see if it really was worth the $60 to purchase and that is where your review came in. I am absolutely going to buy it when the trial is over and add in to one of my budget categories for next month 🙂 I know you can import data, but I think I will continue to manually enter all my transactions. I think this will really help us to stay accountable when I am having to enter those one by one!! Even with the great functionality of YNAB, if you dont see or use the info, it wont help you! Thanks for the great review! Sophie, I think you’ll love YNAB as much as I do. I get your approach to manually inputting data but even with the auto import, you still have to assign categories and that gives me plenty of accountability. Try both and see how you feel. I would love to hear about your experience. Thank you for this review, I was a MM user until I was forced to go with Quicken, which worked fine for me until I was once again forced to upgrade to 2013. It’s horrible. Spent way to may hours with tech support which fixed the problem for a day. Thought about Quickbooks, but they charge a monthly fee now. I’m going to give YNAB a try! I went from Quicken too. I think you’ll LOVE YNAB! Let me know…ok? It’s been a couple of weeks now using the free trial and I am definitely going to buy it. So much easier and clearer that Quicken, and the support is great, unlike Quicken. Again thanks for your review on this. Were you paid by YNAB in any way for this review? No. I was not paid for the review. I am an affiliate and get paid if people purchase the product. This never influences my reviews. There are several reviews that I have written that pan products. Also, I have the latitude to review any product I like. I love YNAB and use it. So does my family. They love it too. Most of the people who buy it from this site send me emails telling me how much they love it too. I honestly think this is a wonderful product that can change people’s lives. Do you track your spending? How? Neal, I came across your site while searching for YNAB reviews. Looks like you have some great info here, will start reading though all of it. This specific blog entry was very well done, thanks so much. I’m looking initially to just track my expenses and have a reality check then take steps to stay within a budget. Will YNAB prevent me from entering expenses into a budget category for a given month if it exceeds an amount, i.e. do I HAVE to enter a ceiling amount for a budget category? George, the program won’t prevent you from entering a figure higher than your budget. But it will create a deficit and gently remind you to cut back to cover that deficit. You don’t have to enter a ceiling amount but that is where the budgeting magic happens. Why not take it for a test run and report back to us to tell us what you think. Most of the people who do that are pretty happy. I know that’s what I did and I’ve been a huge fan ever since. wow thanks guys! lots of activity on this forum! I’d really love to see YNAB expand from focusing on just helping the live pay-check-to-paycheck audience to also helping the finance savvy audience. Johnny, my experience is that YNAB is also very useful to people who are not living paycheck to paycheck. And personally, I don’t think that the investment side is something that needs to be incorporated into the software. It wouldn’t make sense in my opinion. But what would be great is to use YNAB reports to do tax prep work. That would be consistent in my mind. I was a user of MS Money also. Used it for at least 8-9 years and absolutely love it. Ever since I moved to MACs I have had to let it go and have not found anything that comes close to matching MS Money. I downloaded the YNAB trial and played with it for a few days now. It is pretty and friendly. One thing that I really find strange is the inability to categorize INCOME types i.e. I have SALARY, OVERTIME, BONUS, INTEREST, RENTAL INCOME, GIFTS set up in MS Money. But in YNAB I don’t seem to be able to do this. I know I can put this info in the PAYEE field but it doesn’t help me when I run an END OF YEAR report for tax returns. I need to clearly break out INTEREST from SALARY etc. I also find it difficult to categorize TAXES as a result i.e. how do I enter INCOME TAX from SALARY, TAX from Interest income etc into YNAB and have it track & summarise accordingly (again, useful for end of year tax returns). I might be just misinformed as I’ve only used the programme for a few days though. I’ll keep using it thru the 34 day trial and see. If any of you out there knows how to solve the above issues please drop me a line! thanks! at least for now, YNAB is the best contender I’ve tried! Valid question. I am going to forward this to Jesse (Mr. YNAB) and see what they come up with. I personally do not categorize my income using YNAB but I suppose if I had too, I could use the memo section…..? I’d have to look into that. Meanwhile, let’s see what Jesse says. Thanks for the thoughtful comment sir. By default any category you create or edit is for outflows only as the software limits income to the 2 pre-defined categories of “Income for [name of THIS month]” and “Income for [name of NEXT month]”. With that in mind you can record income and use the Payee field to record the source while placing more details about the transaction in the memo. When you do so it will keep separate income sources organized so you can search for them with ease while in the register and break them down in the Income vs Expense report. You can also flag transactions for different purposes and when you type the letter F into the search filter it will allow you to only see those transactions to then print out or export for further manipulation. Thanks Steve. I think what Johnny is looking for is an easy tax prep solution. That would make YNAB even more powerful (and marketable). Would you consider adding that functionality? Awesome! I figured it would be a big shift and something that would take time. But I think it’s a great move for your fantastic software! Can’t wait man. While we’re keen on expanding what YNAB can do (at a measured pace) I’m not certain if or when tax prep integration will arrive. hey Steve, thanks for your feedback. Just on the ‘tax prep integration’. I think in order to avoid having to customize this module for different countries etc, even just the ability to run off a report summarising up all the different categories would suffice. Now, that’d only work if the categories include both INCOME & EXPENSES. Ideally, a CATEGORY is a CATEGORY and hence can be both INFLOW or OUTFLOW right? btw. being able to budget your INCOME surely would help those of us who perhaps get paid hourly and hence have a variable monthly income (if 1 month’s income is short, they’ll know they need to recover by working some overtime the next month etc). I’ve been a user of MS Money ever since I owned my first checking account: yes, the MS Money that no longer exists. The reason? Budget forecasting. While other programs have done an adequate job at reporting, I’ve unfortunately yet to find another program (Quicken included) that lets me budget 3, 6, even 12 months ahead of time and provide a cashflow forecast based on all this information; however, the one hurdle of this model is that any unexpected expenses will force me to spend quite a bit of time reworking the budget so that my forecast balance is back to black instead of red. With that said, I’ve been looking for an upgrade and while it will be difficult, I think I’m willing to let the forecast model go if I am able to ensure our funds are accountable to all our expenses and savings. My wife absolutely hates the complicated forecast model, and this may actually be a good compromise. The fact that our budget information can be accessed through her smart phone means she won’t be tied down to a computer just to check our budget (like we are forced to do with the archaic MS Money). Thank you for the comprehensive review. Even two years later it is extremely useful! I’m going to go ahead and give it a try, and use the two systems concurrently to see if this “zero day” budgeting works for us. If it works, I may finally end up dropping the forecasting system after 17 years of using it. fantastic post, I have been a user of YNAB since it came out. My husband lost his job 14 years ago and that time it was one of the most terrifying times of our life and we went seriosly into debt . Then I started using YNAB and it helped me get rid of the debt and onto the right road. Now it has happened again- no job, but working with Ynab we realise we can comfortably exist for 22 months before we have to start cutting back and if we do cut back, then probably the other half will not need a job at all! Needless to say we will cut back as we can, but we are not paralysed this time by the the thought that we have no money. My other half can look round and get a good job again, not take the first one offered because we desperately need the money. We have also invested in shares and have rental properties now. I have a seperate category in Ynab that relates to their expenses etc that I set up It makes it so easy for tax purposes. Lee , sorry to hear about your husband’s employment situation but I’m delighted that YNAB has come to the rescue! I feel the same way -I just can’t let a few weeks go by w/out updating the program. It’s a powerful feeling to know what your cost of living is and then being able to navigate tough times. That’s what YNAB is designed for – to give you the power. I love it. OK….hey BTW, did you download the newest version of YNAB w/the reconciliation? It’s great. We’re a retired couple, living mostly on our investments which are in flux at present as we make portfolio adjustments to convert ourselves to retirement vs. earnings-years objectives and risk parameters. Our approach for making withdrawals for our spending needs is to use a total-return rather than dividends-plus-interest strategy, especially as we get deeper into retirement mode. Needless to say, however, our investment income is vulnerable to the budget-blasting volatility and risk in the markets caused by our idiots in Congress. How to budget around these kinds of things is a concern. We also have a small rental property which (as most do) runs at a loss each year for tax and budget purposes, and our CPA needs a report at yearend for the schedule-E. Finally, I’m not particularly facile at dealing with the complexity in my existing Quicken— in fact, I’ve all but given up on that program (over the years it’s really screwed me up), and just now found you and YNAB online. With the yearend approaching, it would seem a good time to simplify our lives by getting get our recordkeeping act together before the new year. MY QUESTIONS: Will YNAB rescue my bacon and my ability to sleep a full 8-hours again with some easy downloads of our several accounts from my bank and credit card companies ? And will my CPA love me next year when I give him my box with 12 months’ stuff— and flee town? Does the software track our assets sufficiently to allow an occasional balance sheet report as well as a spending report? ‘Nuff for now, sorry about my ramble. I love YNAB but I don’t think this is going to solve the problem(s). A. YNAB doesn’t track assets/investments. I just give the CPA my 1099 and let him deal with it so it’s no problem. B. Sounds like you are concerned about having enough income. I would suggest you consider a 1031 sale of your rental and get into something that will produce income. Also, make sure you have the right investment strategy which is dynamic. I used to use QUicken and it’s really not bad but I completely STOPPED tracking investments with it. It was too much work and not worth it. Like I said, the 1099 was sufficient and I used Quicken to simply track what I spent on my rental so that was enough. QUicken and YNAB are great – if you use them. Both allow for easy downloads – YNAB is really easy to use for this. The real differentiator is YNAB’s budgeting. It’s easy to see how you’ve done (actuals vs budgeted). I would simplify my use of Quicken but then make sure I do all the downloading for the bank accounts and credit cards and get rid of the obstacles like investment tracking. That worked for me. And again, the move to YNAB was wonderful but only because it helps me track against the budget. Does this help? So far , so good. It’s quite a shift in thinking for us to not look at the balance but look at the budget… I think this is what we’ve been looking for. Will keep you updated. Great. I look forward to it Trent. Exactly right Laura. Since these items are expenses – even though they might not be incurred – you budget them this way so you’ll have the money when you need it. Let me know how it goes. I think you’ll love it. Ah, it makes sense now, wonderful! I kept thinking, “but what do I do with that money every month until it is due?” It wasn’t until I read the “look at the budget, not the balance” that it clicked. Thanks for confirming that. I’m a missionary at a children’s center and my income is both for personal use and my work with my dorm of boys. I have very few fixed or monthly expenses, probably 75% or more are things I need to figure an annual average and divide by 12. So for example, I don’t buy sheets or towels (for 30!) every month but need to budget every month for it since there are so many. This has probably been my biggest obstacle in setting up a budget, how to deal with all these unfixed expenses. I think this might be the ticket! By the way, you are great at replying quickly, thank you! How does ynab compare to Microsoft money in the sense of entering transactions then reconciling them with a download from your bank? I.e. i spent 150 at groceries at costco and want to enter that manually. Can you use ynab to keep track of your balance in real Time? I’ve been trying to budget using Microsoft money for some time now and the ease of use with MM is unparalleled – granted haven’t tried ynab yet. MM is also no longer supported and I am running it on an old windows Machine (we use macs in our fam). I like the concept of ynab, but will try the free trial to see how user friendly it is. Not sure about MM – but I am sure you’re going to love YNAB….I do. Let me know your experiences please! I just purchased the YNAB Software online via the link you list in your review. Is your offer about sending a free copy of your “Money Academy for Couples” e-book still valid? If so, please send me your email address (to “lifeaintez@gmail.com”) and I’ll forward you a copy of the receipt showing my YNAP purchase today. On it’s way! Let me know if you don’t receive the download. I know you’ll love YNAB – especially 4.1. I downloaded the free trial based on this review, and although I’m only about an hour in, I can honestly say without a doubt that YNAB is the real deal. About a week ago, I purchased Quicken Deluxe 2012 in an attempt to create some semblance of order in my finances (I’ve always been a “buy-what-I-want-and-hope-for-the-best” kind of person). Man, was I disappointed. After several maddening, frustrating hours I came to the realization that Quicken is just a collection of programs that are not integrated with each other at all. My Budget tab didn’t take into account my Bills tab, etc, etc, etc. It was also so needlessly complex to the point it just boggled my mind to look at the screen. YNAB is everything Quicken isn’t. It comes off as overly simplistic, but that’s the beauty of it. The complexities run behind the scenes. This software actually works the way my mind does, and at the moment everything “clicked”, I actually shed a single tear of joy. And I NEVER cry. Thank you, Neal– I’ll follow-up in a few months. Now if you’ll excuse me, I’m off for a little target practice with my Quicken CD! I had a similar experience w/Quicken and certainly, like you, I LOVE YNAB. Glad you like it man. Hope you hit a bulls-eye! Hi Neal, I apologize if you’ve answered this already and I just missed it in the FAQs, but can you use YNAB to track account and expenses for a small business? Are there tax reports that can be set up for the small business? Thanks. Laura, YNAB is saying that small business can use YNAB. I currently use Quickbooks for my business only because my CPA wants me too. If he did not ask me for the records in Quickbooks format I would use YNAB for my business. I know about 2 years late, but are you still offering your free e-book “Money Academy for Couples” if YNAB is purchased from the link above? Thank you. I am not completely sure if this is a fit or not. We use it with various accounts and it’s fine. I can’t see why this wouldn’t work for your properties. I also know that YNAB is not being used for small business. Again, I don’t see why you couldn’t do this. I believe they have a 30 day refund policy so you can play w/it and get a refund if it’s not for you. Let me know what you discover. I use YNAB and have an investment property. I created a category and subcategory for my needs. I then export this data and have an excel template that summarises the data that i can than pass on to my accountant. eg; Category: Investment 1; Sub Category, Mortgage Repayments, Rates, Maintenance Repairs, Insurances, Etc. That tracks all my costs, and the rental income is just treated as a next month income. Read the YNAB forums and do their free seminars to get a better understanding of how to use the product for you. It’s a good tool that can help you become more accountable towards your personal expenditure. Thank you for your helpful review of the YNAB software. My wife and I are trying the 34 day free trial right now and YNAB is proving to be easy to use and beneficial. I’ve done the introductory web-training seminar and this Saturday will do another one to learn more. I minored in Accounting in my BS in Business degree and have used a few different types of accounting software. I’m glad this type of software exists; it is actually a bit fun to use and watch how effectively it puts me in control of my financial fate. You’re review is helpful and I think that, after reading it, I’m ready to finally buy the product. Are you still offering a free copy of you book if we use the link here on this web-page? James, I am really happy to hear that you have tried the software. I also found it helpful and we’re been using it for years. A huge side benefit for us was that my wife took it over and got very much involved and really enjoys budgeting – a new thing for us. Not sure what the purpose is except as a check register. The download worked, and I was able to setup the software, but then it crashed after I entered my checking balance and skipped ahead to Payees, at which point it showed me several pop-up balloons with tutorial tips and then quit. Stupid software as far as I can tell. Looks like they are still working out the bugs. So far if it just crashes. Anyone know of a money software program so I can build a list of payees including names, addresses, phone numbers, account numbers, balances due, etc. for the purpose of printing or downloading a list of debtors? Sorry you have this issue. I have never heard of it happening before. Have you contacted the people there? They have been responsive to me. Let me know and I can put you in touch with someone if need be. Thank you for your review of YNAB, I’ve been a financial mess since I first started making money and this software helped me get on track. I’ve shared this with my parents and am excited to have a tool to share with my children when teaching them about managing money. I started using YNAB a year ago after reading your review. I’m nearing retirement and needed to have solid information on spending for retirement planning. I’ve found the program easy to use and very significant for planning my retirement. I know what my future income will be, but have adjusted spending to match projected retirement income (excluding investments)a full two years in advance. This budget program is one of the most helpful retirement tools I’ve found. I agree. It’s worth every penny! My kids love it as well. Thanks for the review! I came across the YNAB webpage the other day but wasn’t sure. Your review was really helpful. I just went ahead and signed up for the Free Class that they offer to learn even more. Cool. Let me know how you like it Marie. I have never taken any of the classes and would be very interested to hear your thoughts. Is YNAB a double-entry accounting software? How is it different from iBank 4 Budget features? Hi H. IYER – there is no chart of accounts, only budget categories which you compare actual to budgeted. So no, this is not a double-entry accounting software solution. As a recent update has been released; I can type in transactions on my iphone, sync with the product when i get home. I can then import transactions that i may have missed recording via my bank export. YNAB is smart enough to recognise the double ups and only imports the transactions that aren’t duplicates (this feature is amazing) so i am basically only needing to track cash/wallet spending’s and can import from my bank software daily/weekly/periodically. Also it has taken me a while to understand the buffer principle… but it is a major part of the YNAB paradigm as you need it to know if you’re on budget or not. 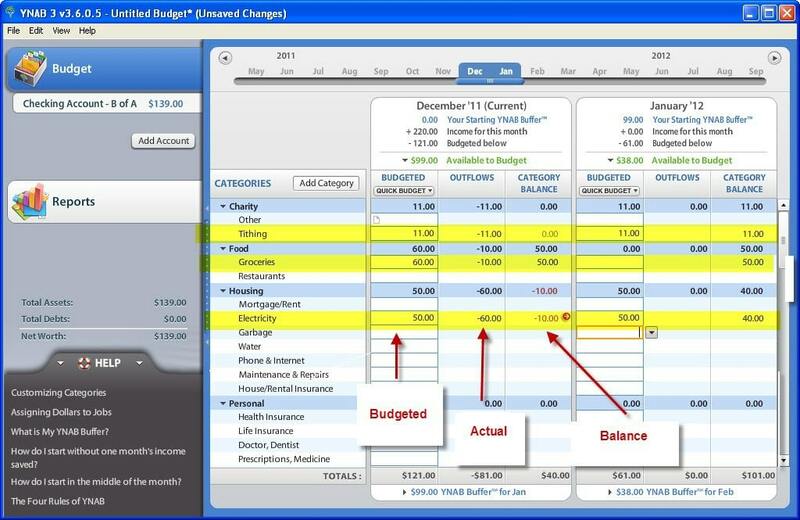 Most personal budgeting software i’ve used, allows you to forecast your income but only recognize your actual costs. But as you’re spending last months income this month you don’t need to forecast income anymore. Very clever. Anyway, thanks for the review. It’s really hard to find any h8rs for YNAB. hopefully someone soon will tell me why it doesn’t work for them (atm it looks perfect for me and my family). @Judy YNAB differs from mvelopes in that it works offline (YNAB is locally installed on your computer) and is a one time cost (no monthly fee). Does YNAB do the same thing as mvelopes? I use a coupon folder for the cash envelope system and my husband keeps his part of the budget in the bank…payments, car and household repairs etc. The problem: he doesn’t keep track of it and it dissolves. He is the one who keeps track of the budget and it is driving me nuts that there is no bottom line anywhere for each category or envelope. You mention downloading something from the bank, what is that? Well, I am going to have to try it. I am so happy I found out about it. I have been using Crown Money Map for years because it does basically the same thing (uses what is commonly known as the “envelope” system). YNAB is slightly different from what I read but it also assigns money a job. I have been quite dissapointed in the performance and support of Money Map but thought I had no alternative as I don’t want to use an online “envelope” system. I am so happy to find out about this. Not sure if it’s CSV. YNAB reads it right into the software. I ask because my husband’s credit union account does not have Quickbooks format for checking or the credit card accounts. This means that I have to input all data by hand, or invest in and learn a conversion tool. We do our personal banking through Wells Fargo and they have Quicken, Quickbooks and CSV formats. I will do a bit more checking with YNAB and make sure one of those formats is acceptable. Thanks, Neal! Yes. I download data no problem. Is the download CSV format? I’m a Quicken user & recently reviewed the program as well (still in progress but wrote an intro article). Neal gave a great reivew which initially turned me on to it. To answer your question – You can import data in all the major formats including csv. You can also export the information to csv if need be. Really!? I need to check it out. It allows me to download transactions from the banks, too? How do I order your book free when purchasing YNAB thru your link? It doesn’t tell me. The link to your book just takes me to Amazon to purchase it. Yes. That’s how you’d do it. We clicked on the link above and purchased YNAB. We’re interested in receiving the free e-book, but where do we send the receipt? So if I started my budget now and I had an annual bill due in February, would I budget the necessary funds over the next 5-6 months and then cut back the budgeted amount for that category in Feb after that payment is made (budget over 12 months)? Thanks for your help and I enjoyed your review. What a great review! I have been using YNAB for about a year now, and it is truly amazing. Too hard to grasp how fundamentally different/unique this app is when compared to Quicken, etc. And the support is outstanding, from the developers, to the interactive forums, to the training videos, if you have a question you WILL get in-depth answers until you are completely up to speed on your issue. Same goes for brainstorming any budgeting/spending habits questions you may seek advise for from other users. Simply stated, I don’t expect anyone requests a refund after using the app. While I’m always pleased to read reviews of YNAB (I’m the customer service manager at ynab.com for those that don’t know) your approach right at the start explaining *why* budgeting is important was refreshing to read and hopefully motivates your readers to action – whether it is with YNAB or some other approach. As an aside, I noticed that I goofed in my response to your FAQ inquiries regarding automatic backups before you wrote your review. The answer I provided you with applies to auto-SAVES but not automatic backups. That feature (saves) is on the way and the response there fits. Backups are already a feature and here is how it works. YNAB automatically backs up your file to a folder directly under where you save your file to or to one that you designate. When it does so it renames the file in relation to the date/time that you saved it so that you have a handy archive of 10 recent saves to fall back upon should you need to step back for any reason. Even with the automatic backup it’s very important that you backup elsewhere as well since if the drive that you are saving to goes bad or is lost you’re out of luck. Thanks! I’m really happy that you joined us on the journey and I’m very pleased that you dig YNAB as much as I do. I discovered it only because people like you raved about it so much I had to take a peek myself. Thanks for those very kind words. Hi Neal, I discovered your website at one of the trackbacks at YNAB website. I’ve already read through all 34 pages of your blog and I love it. I especially love that you address self-employed individuals as not that many financial websites do. The financial planning needs of self-employed individuals are different from those of the employed. Anywho, returning to the topic at hand, I love YNAB. I’ve been using it (somewhat inconsistently) for the past year and definitely think that it’s an improvement over Money. I’ve recommended it to so many friends and colleagues that they think that either (1) I’m crazy (possibly true) or (2) work for YNAB on the sly (false). I just did some webinars last night and discovered tips to improve how I use YNAB so I definitely find that customer support is better than with other software vendors. Re the deficit spending issue, my husband never understands when I tell him that we don’t have money to buy something at Best Buy when he clearly sees money sitting in our bank accounts. YNAB has taught me to spend by the budget rather than the account, so I find it helpful and it also has helped me (in my mind at least) be less of a cheapskate wife when I see that we have money that’s available to spend above our budgeted amounts. I don’t use it for work because I use industry-specific software so I can’t speak on that issue. I do find, however, that my management of cash itself needs improvement and hope that YNAB will put out some mobile/Blackberry solution that I can use at the Starbucks counter when I remember. YNAB users are so in love with this program, and Jesse and the rest of the YNAB team are so personable, that the forums area a major source of pleasure in using this software. Newbies will always find oldbies and power-users to answer any question–and I’ve never seen a question that hasn’t been answered within 24 hours. Some questions are answered with a quick point to a previous thread, but people will also stick with you on anything difficult until things are crystal-clear. I’ve never seen a friendlier, more polite, helpful and positive group anywhere on the World Wide Web. that’s been my experience as well so far. i think they’ll bury Quicken if nobody buys them out. Thanks…the link is working now. GO GET IT MAN! Let me know what you think about the program. Sorry dude. Tried the link to buy it, doesn’t work. BTW really enjoyed your post a while back about becoming a CFP. I currently use Mint for budgeting & I’d be interested in a brefi post comparing the 2. Its a great review but I’m not sure why I need to spend the $60 when Mint is free. I will add however, I do not live paycheck to paycheck. Thanks….those are very kind words. Let me know what you think of the program! I was blown out of the water with your first sentence. This is a GREAT review. Surprised there isn’t more feedback yet, this is probably one of the more comprehensive reviews I’ve seen. A Quicken user for several years now, I’ve been interested in checking out this program as I’ve seen it popping up in more places.